Sour beers seem to be on a constant and steady rise in popularity; fruited sour beers seem to be on an even more dramatic trajectory. 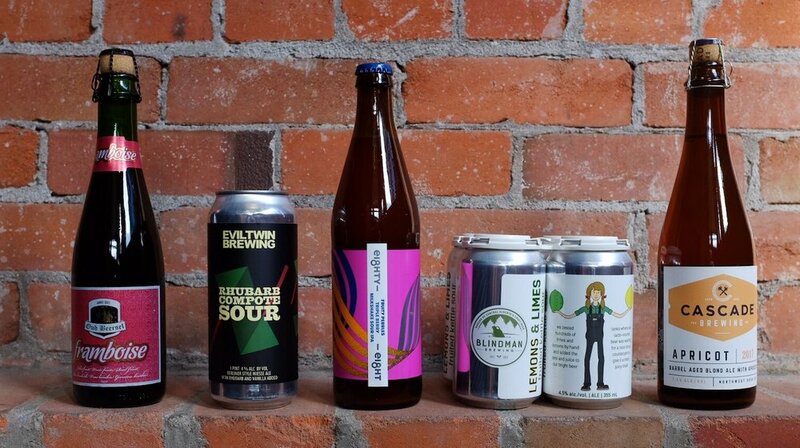 Be it raspberry or cherry, apricot or rhubarb, fruity sours are all the rage right now and breweries keep putting out more and more fun combinations. This style of sour seems to please a large population of palates. Sour beers are often compared to wine in terms of complexity of flavour and acidity, so they often appeal to the wine, cider, and beer crowds alike. It's not just bright fresh styles of sour beer that have fruit added, but also classic styles that are a little more intensely feral. If sour beers are new to you, fruited sours are an awesome place to start; the natural tartness of fruit is a familiar flavour to most. If you’re already a sour beer expert, you’ll know just how refreshingly crushable these beers are! The following is a small selection of one of our favourite beer categories. Get ‘em while you can! Cascade Brewing is a standard bearer for quality sour beers from the west coast. They intentionally make fresh, new world styles of sour beer. Established in 1998 by Art Larrance and Ron Gansberg, Cascade intentionally avoided the “hops arms race” that was dominating the west coast beer scene. They started off making traditional ales, and naturally grew into some of the most well regarded sour beer producers in North America. A blend of sour blonde ales, the base beer for the Cascade Apricot is aged, unfruited for 7 months in barrel, after which 13,000 pounds of fresh apricots are added. The beer is then aged for 7 more months and the resulting beer is tart with tons of apricot-y freshness and a subtle hint of sweet spice from the oak. This beer, which they’ve been making since 2007, is a staple for Cascade and is well known among beer geeks world wide as a seriously great new world sour beer. At the helm of the craft beer movement, Blindman Brewing established itself for high quality beers long before the massive Alberta beer boom took place. Located in Lacombe, Alberta, they take advantage of one Alberta’s unique attributes: awesome local ingredients for producing beer. Blindman has a vast core line up of beers that includes a range of styles that all happen to be of very high quality. The Lemons & Limes Kettle Sour was sure to be a hit after the success of their unfruited kettle sour. Using real lemons and limes, Blindman juices thousands of citrus fruits to make this delightfully easy going beer. It is subtly tart, rather than overtly sour, and is somehow so reminiscent of how you wish 7up tasted. We aren’t sure there is a beer more suited to patio sipping. 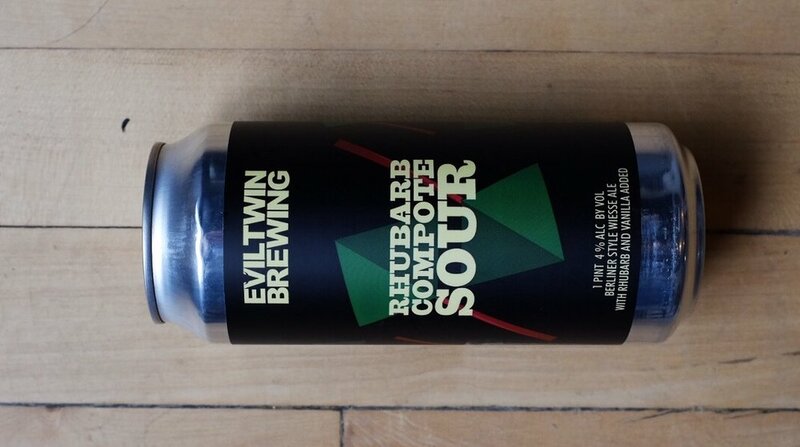 Evil Twin does not operate out of one brewery, but instead collaborates or uses the space of other breweries to create their distinctly unique beers. While they have a core line up, they are well known for the multitude of one-off beers they create. Founder, Jeppe Jarnit-Bjergsø, is from Copenhagen, but the beers are brewed around the world. With some of the most intriguing flavour combinations out there, trying an Evil Twin beer is always an experience to be remembered. The Rhubarb Compote Sour is pretty much exactly what it sounds: delicious. The inherent tartness of rhubarb pairs so well with the lacto-sourness of the beer. Add a touch of vanilla to bring how the home-baked pie imagery and a dash of saltiness to balance it all out, and you’ve got yourself a surprisingly refreshing, yet decadent treat. While sweetness of rhubarb and vanilla perhaps lead your mind to the dessert realm of beers, we think this beer is good for breakfast, lunch, and dinner. Our pals at Eighty-Eight Brewing are always up to something fun. Established last year, they have been killing the Calgary brew scene. Their brew house not only offers their awesome beers (which all have a kitschy 1980s names to go with), but also houses Noble Pie, which is quickly establishing itself as some of the best ‘za in town. Eighty-Eight Brewing’s Fruity Pebbles is back by popular demand. They released this tasty brew a while back and it was so well received that a comeback was 100% necessary. This hazy sour beer is loaded up with blackberries, raspberries, and blueberries which creates its awesome pinky-purple hue as well as the intensely fruity drinking experience. Hops and lactose milk sugar round out this tasty little number. While this beer is certainly fresh, it has a pleasant density that sours sometimes miss! Not all fruited sours are the clean, brightly acidic beers many of us have come to expect. Adding fruit to sour beer has a long history in Belgium where lambic beers have been brewed for centuries. Lambics are the result of spontaneous fermentation and the ambient presence of naturally occurring microorganisms that affect the flavour of the beer, which is aged in oak barrels that are often left open to the breweries yeast and microbe filled air. The resulting beers are quite vinous, rather rustic, and definitely complex. Oud Beersel was established in 1882 and has been making traditional styles of Belgian beer ever since. Their Framboise is a blend of young and old lambics combined with whole raspberries and a few cherries to balance the natural sweetness of the raspberries. Intensely juicy, tart, and a little bit feral, this is a must try style of fruited sour beer.